The present study examined continuous and discrete bimanual drumming in response to different instructions in 10 adults with Down syndrome, 10 mental age-matched and 10 chronological age-matched groups. For continuous drumming, participants hit two drums with both hands at the same time following verbal (e.g., "up" and "down"), visual (e.g., video of both drumsticks moving up and down together) and auditory (e.g., sound of both drums being hit, then symbol being hit) instructions for 10 s. For discrete drumming participants hit two drums with both hands at the same time once in response to the instructions described above. In general, for all groups spatial measures showed a performance advantage when using the visual metronome in continuous tasks but no advantage with any instructions for discrete tasks. People with Down syndrome are living twice as long today as they did in the early 1980s because of medical advances and increasing knowledge concerning the treatment of people with Down syndrome (Yang, Rasmussen & Friedman, 2002). Many scientists have found that adults with Down syndrome move slower, less coordinated, and less accurately than the typical population (see Weeks, Chua & Elliott, 2000; Ringenbach, Chua, Maraj, Kao & Weeks, 2002; Robertson, Van Gemmert & Maraj, 2002; Ringenbach, Ericsson & Kao, 2003; Ringenbach & Lantero, 2005). One important difference is how they interpret visual, auditory, and verbal information into appropriate movement responses. For example, imagine if a person with Down syndrome hears a car horn (auditory-motor), hears someone yell, "Get out of the way!" (verbal-motor), or sees a car coming close to them (visual-motor), which type of information would result in them moving to safety the quickest? Thus, finding instruction preferences for motor skills is important to develop methods of instruction that are more compatible with the learning processes of adults with Down syndrome. Previous research has suggested that persons with Down syndrome have more difficulty interpreting verbal instructions into accurate movements (i.e., verbal-motor deficit) than visual instructions (i.e., visual-motor advantage), whereas people with undifferentiated developmental disabilities and chronological age-matched controls do not (Elliott, Weeks & Elliott, 1987). Initial research suggested that persons with Down syndrome might have completely reversed cerebral specialisation from the typical population (Hartley, 1982; Pipe, 1988). However, further research suggested that, rather than a completely reversed cerebral specialisation, cerebral differences are confined to speech perception (Elliot, Weeks & Elliot, 1987). This theory suggests that people with Down syndrome perceive speech in the opposite hemisphere as typical persons. The problem arises for people with Down syndrome in verbal-motor situations because the left hemisphere is involved in movement organisation, whereas the right hemisphere is involved in verbal perception. Thus, when instructions are given verbally (e.g., "tie your shoe"), the words are perceived in the right hemisphere in persons with Down syndrome, and then must cross the corpus callosum to the left hemisphere to be organised into a movement. In the typical population, however, verbal perception and movement organisation both occur in the left hemisphere. It is hypothesised that the crossing of information to the opposite hemisphere results in information being lost, confused or slowed in persons with Down syndrome (Elliott & Weeks, 1993). The transmission of information between cerebral hemispheres becomes even more of a problem for persons with Down syndrome who have been shown to have a thinner than average corpus callosum (Wang, Doherty, Hesselink & Bellugi, 1992). Much of the research investigating the above-described model of atypical cerebral specialisation in persons with Down syndrome has used unimanual discrete (i.e., one time) movements (e.g., flip a switch) (Elliott & Weeks, 1990). However, in activities of daily living people not only perform unimanual discrete actions (e.g., reaching), they sometimes perform bimanual discrete (e.g., pulling on pants), and bimanual continuous (e.g. clapping) movements. Recent research investigating bimanual continuous movements (e.g., clapping) revealed that adults with Down syndrome performed bimanual continuous movements more accurately in auditory-motor (i.e., auditory-motor advantage), than verbal-motor (Robertson et al., 2002), or visual-motor (Ringenbach et al., 2002) situations. These results are not consistent with the visual-motor advantage found for unimanual discrete movements in adults with Down syndrome predicted by the model of atypical cerebral specialisation. Thus, it is necessary to examine the generalisation of the model of atypical cerebral specialisation. To our knowledge, no research has investigated discrete and continuous movements within adults with Down syndrome in the same study. Thus, the present study examined differences between discrete (defined as a movement performed once) and continuous (defined as a movement performed repeatedly over time) conditions in bimanual symmetrical movements. Secondly, a more real-world task (e.g., drumming) was used than has previously been studied (e.g., line drawing, circle drawing). Research has shown that people with Down syndrome have an affinity towards music and rhythm (Edenfield & Hughes, 1991; Valasquez, 1991). Consequently, drumming movements were tested in order to maintain attention span and increase motivation. The purpose of this study is to examine differences in instruction type preferences between continuous and discrete bimanual drumming in adults with Down syndrome. Therefore, the working hypothesis is that adults with Down syndrome will show a visual-motor advantage for discrete drumming, but an auditory-motor advantage for continuous drumming, whereas chronological age-matched and mental age-matched comparison groups will perform similarly under all instructions and tasks. Thirty participants were included in the study. One group consisted of 10 adults with Down syndrome (MCA=30.2 years, SDCA = 5.5 years, MMA = 7.2 years, SDMA = 2.7 years). Two comparison groups consisted of 10 chronological age-matched participants (MCA= 29.8 years, SDCA = 5.5 years) and 10 mental age-matched participants (MMA = 7.7 years, SDMA = 2.8 years). The mental age of the participants with Down syndrome was ascertained using the Peabody Picture Vocabulary Test (3rd Ed. ; PPVT-III). The mental age of the comparison groups was assumed equal to their chronological age. Participants were screened for handedness using a shortened six-item handedness inventory (Oldfield, 1971). Adults with Down syndrome and the mental age-matched comparison group physically wrote with a pen, drew a circle with a pen, used scissors to cut paper, threw a tennis ball, pretended to eat with a spoon and pretended to brush their teeth. The chronological age-matched comparison group answered verbally which hand they used for the aforementioned tasks. Only right-handed participants with normal or corrected-to-normal vision and no known neurological disorders were included. All protocols were approved by the Human Subjects Institutional Review Board of Arizona State University. Continuous and discrete bimanual drumming movements were both performed at self-selected amplitudes and in symmetrical coordination. The movements were performed on two drums, each with a diameter of approximately 25cm, separated by a distance of approximately 7cm. The drums were attached to a flat surface. Drumming was performed in the sagittal plane (e.g., up and down). Data was collected from sensors, attached to the ends of each drumstick, which were approximately 30cm long, using an electromagnetic tracking data collection system (Polhemus UltratrakTM). The position movement data was sampled at 120 Hz (samples/s) per sensor and was collected in the z dimension, which captures cephalo-caudal or up-and-down movements, and the y dimension, which corresponds to anterior-posterior or front-to-back movements. Drumming movements were coordinated following three different instruction types. Discrete: The computer says "down", indicating the initiation of one drum hit. Continuous: The computer says "down", "up", "down", "up", etc. and cycles between the two words every 500 ms (i.e., one drum hit for every 1000 ms). Discrete: The computer makes the sound of both drums being hit once, indicating the initiation of one drum hit. Continuous: The computer either makes the sound of both drums being hit (explained as indicating down) or a cymbal being hit (explained as indicating up) and cycles between the two sounds every 500 ms (i.e., one drum hit for every 1000 ms). Discrete: A computer monitor in front of the participants shows video of both drumsticks moving down and up once, indicating the initiation of one drum hit. Continuous: A computer monitor in front of the participant shows video of both drumsticks moving down and up at the same time; with one complete drum hit (e.g., down and up) every 1000 ms.
All participants were seated in a wooden chair positioned at a comfortable table height. Upon arrival, participants read (or were read) and signed the informed consent or assent forms. A parent or guardian also signed a consent form for the mental age-matched and Down syndrome participants. The handedness inventory was then administered and scored. The participants held the drumsticks labelled one and two in the right and left hands respectively. They were instructed to hold the drumsticks in front of them above the centre of each drum with an overhand grip. Instructions were given to drum in time to the metronome following the different instruction types (i.e., verbal, auditory, visual). For each different instruction type, tasks were performed either bimanually discrete or bimanually continuous. Instruction type conditions were counterbalanced across participants. A total of 18 trials (three in each condition) were collected. The length of the entire testing session lasted no longer than 45 minutes in order to reduce attentional and motivational limitations. The total time for drumming was six minutes, thus we are confident that muscular fatigue is not a factor. All data were filtered using a 5th order 6 Hz Butterworth filter in both the forward and backward directions. For differentiation of the filtered data, a three-point central difference technique was used. All graphical and numerical techniques were completed using MatlabTM. Movement rate was calculated as the time it took in ms to complete a down and up movement. For continuous movements this was calculated cycle-by-cycle and then averaged over a trial. For discrete movements this was calculated for the one down and up movement. Like rate, for continuous movements, amplitude was calculated cycle-by-cycle and then averaged over a trial and discrete movements were calculated for the one drum hit. An aspect ratio of the z- and y-amplitudes was used to estimate the path of the movement (i.e., values closer to 0.0 indicates a linear straight up and down movement, whereas higher values closer to 1.0 indicate a more curvilinear path) (Franz, Zelaznik & McCabe, 1991), which also was calculated cycle-by-cycle and then averaged over a trial for continuous drumming and calculated once for the discrete drumming. Relative phase was measured in the z-dimension. To obtain a continuous measure of relative phase, the displacement and velocity records for each movement cycle were normalised. The absolute difference between the phase angles of the left and right hands was calculated for each sample. The mean relative phase was calculated across samples within a trial. In keeping with the standards set by previous studies (e.g., Carson, Thomas, Summers, Walters & Semjen, 1997; Robertson, 2001; Scholz & Kelso, 1990), relative phase values between 0° and 45o described in-phase, values between 135° and 180o described anti-phase, and the range of 46° - 134o described intermediate phase. The percentage of time during a trial spent in each of these coordination patterns served as an index of coordination stability. For all analyses, if there were no problem trials, the first trial was eliminated as a practice trial and the remaining two were averaged across conditions. In addition, all analyses were collapsed across gender because there were no expectations of gender differences in this type of task (Ringenbach et al., 2003). Analyses of variance (ANOVA) were performed on mean movement time, amplitude and aspect ratio. Three mixed-factorial ANOVAs were conducted with a between-groups variable of Group (chronological age-matched, mental age-matched, Down syndrome) and three repeated measures variables of Task (discrete, continuous), Instruction Type (verbal, auditory, visual), and Hand (right, left). Coordination analyses were conducted on the mean relative phase, and percentage of time in each coordination pattern (in-phase, anti-phase, intermediate phase). Four mixed-factorial ANOVAs were conducted with a between-groups variable of Group (chronological age-matched, mental age-matched, Down syndrome) and two repeated measures variables of Coordination (discrete, continuous) and Instruction Type (verbal, visual, auditory). Huynh-Feldt corrected ANOVA statistic is reported throughout. In addition, Tukey HSD procedures were used to follow-up significant effects of all pairwise comparisons of between subject variables and t-tests were used to follow-up significant effects of all pairwise comparisons of within subject variables. All significant and relevant results are reported. For mean movement time, there was a significant main effect for task, F(1,27) = 34.39, p<0.001. This showed that the continuous drumming was performed for a larger duration (Mcontinuous = 1061ms) in comparison to discrete drumming (Mdiscrete = 646ms). This is reasonable considering the task differences, in which continuous drumming involved a reversal of movement. Figure 1 | Mean aspect ratio as a function of group, task and instruction type. On the measure of movement shape (i.e., mean aspect ratio) values closer to 0.0 indicate a linear straight up and down movement of the drumsticks, whereas higher values closer to 1.0, indicate a more curvilinear path in which more of a semicircle was produced by bringing the drumsticks towards both shoulders. There were a main effects for group, F(2,27) = 11.67, p<0.001, task, F(1,27) = 245.25, p<0.001 and instruction type, F(2,54) = 27.88, p<0.001. Post hoc tests indicated that chronological age-matched participants followed more vertical paths (MCA=0.15) than mental age-matched and Down syndrome participants who produced drumming movements with more curvilinear paths (MMA=0.32, MDS=0.30), and that visual instructions resulted in more linear movements than auditory and verbal instructions (Mvisual=0.18, Mauditory=0.30, Mverbal=0.29). For the task main effect, continuous drumming resulted in less vertical and more curvilinear paths than discrete drumming (Mcontinuous=0.49, Mdiscrete=0.02). Furthermore, there were two-way interactions between group and task, F(2,27) = 8.22, p<0.002, group and instruction type, F(4,54) = 2.84, p<0.04, and task and instruction type, F(2,54) = 37.81, p<0.0001. As can be seen in Figure 1, post hoc analysis of the group by task interaction indicated that the chronological age-matched group produced more linear movements than the mental age-matched and Down syndrome group in continuous drumming, whereas discrete drumming was performed similarly by all groups and more linearly than continuous drumming. Post hoc analysis of the group by instruction type interaction showed that the chronological age-matched group produced more linear movements than the mental age-matched and Down syndrome group for all instruction types and that for chronological age-matched and Down syndrome participants, visual instructions resulted in more linear movements than auditory and verbal instructions (refer to Figure 1). Thus, the mental age-matched group produced similar movement paths for all instruction types. Post hoc analysis of the task by instruction type interaction revealed that for continuous movements, visual instructions resulted in more linear movements than auditory and verbal instructions, whereas discrete movements were more linear than continuous movements and there were no differences between instruction types. The two-way interactions were superseded by a three way group by task by instruction type interaction, F(4,54) = 2.71, p<0.04, which is depicted in Figure 1. Post hoc analysis indicated that the three-way interaction occurred because for adults with Down syndrome in continuous drumming, while visual instructions produced the most linear movements, auditory instructions produced movements that were also more linear than verbal instructions. Figure 2 | Mean amplitude as a function of group, task and instruction type. For the measure of mean amplitude, there were main effects of group, F(2,27) = 3.52, p<0.05, instruction type, F(2,54) = 15.08, p<0.001, and hand, F(1,27) = 5.61, p<0.03. Post hoc analysis showed that chronological age-matched adults produced smaller movements than adults with Down syndrome (MCA=17.1cm, MMA=21.5cm, MDS=23.7cm). 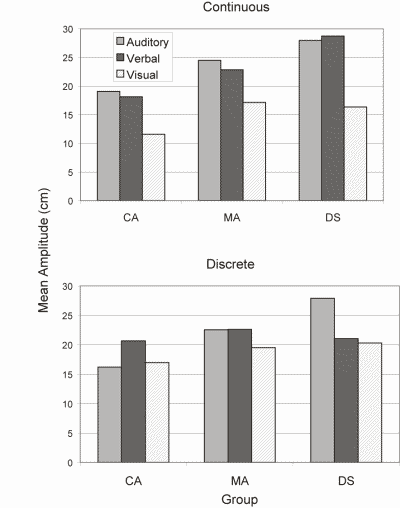 For instruction type, movements performed using visual instructions resulted in smaller vertical movements than auditory and verbal instructions (Mvisual=17cm, Mauditory=23cm, Mverbal=22cm). For hand, the right hand produced larger movements than the left hand (MRight=21cm, MLeft=20cm). Additionally, there were three two-way interactions between task and instruction type, F(2,54) = 8.03, p<0.001, hand and group, F(2,27) = 5.11, p<0.02, and task and hand F(1,27) = 4.54, p<0.05. The task by instruction type interaction was mediated by a group by task by instruction type, F(4,54) = 3.26, p<0.02 interaction. As can be seen in Figure 2, and post hoc analysis confirmed that for discrete drumming there were no differences among instruction types for chronological age-matched and mental age-matched adults, whereas for adults with Down syndrome larger movements were produced with the auditory instruction than with the visual instruction. For the continuous drumming the visual instructions resulted in smaller movements than the auditory and verbal instructions for all groups. Between tasks, adults with Down syndrome produced larger movements with the verbal instructions in continuous than discrete drumming and chronological age-matched adults produced larger movements with the visual instructions in discrete than continuous drumming. In the hand by group interaction post hoc analysis indicated that there was a difference between the hands in the adults with Down syndrome, with the right hand producing larger movements than the left hand. In the other groups the hands were not different. In addition the chronological age-matched group produced shorter movements with both hands than the Down syndrome group and shorter movements with their right hand than the mental age-matched group's right hand. This result, of poorer performance of the nondominant hand in persons with Down syndrome, is consistent with previous research (Ringenbach et al., 2003). In the task by hand interaction, post hoc analysis revealed that there was no difference between the left and right hands in the continuous task, whereas for the discrete task, the right hand produced larger movements than the left hand. It appears that the dominant hand was more forceful than the nondominant hand in one time actions, which is likely related to greater experience using the right hand. For the measure of mean relative phase, there were significant main effects for group, F(2,27) = 7.05, p< .004 and task, F(1,27) = 4.96, p< .04. Post hoc analysis indicated that chronological age-matched adults were more closely coordinated to in-phase than mental age-matched (MCA = 13.3, MMA = 23.24, MDS = 18.62) and that discrete movements were more closely coordinated to in-phase than continuous movements (Mdiscrete = 16.82, Mcontinuous = 19.9). These main effects were mediated by a task by instruction type interaction, F(2,54) = 3.27, p< .05. Post hoc analysis revealed that for continuous drumming, participants were less coordinated with visual instructions than verbal and auditory, whereas similar to movement path results, there were no differences among instruction types for discrete drumming. For the measure of percent of time in in-phase, there were significant main effects for group, F(2,27) = 6.29, p< .006, and task, F(1,27) = 9.71, p< .005. Post hoc analysis showed that the chronological age-matched group spent more time in symmetrical coordination than the mental age-matched (MCA = 92.2%, MMA = 84.7%, MDS = 87.6%) and more time was spent in in-phase coordination in discrete drumming than continuous drumming (Mdiscrete = 90.0%, Mcontinuous = 86.35%). For the measure of percent of time in anti-phase coordination, there were significant main effects for group, F(2,27) = 3.46, p< .05, and task, F(1,27) = 6.62, p< .02. Post hoc analysis indicated that the chronological age-matched group spent less time in anti-phase drumming than the mental age-matched (MCA = 1.06%, MMA = 4.03%, MDS = 2.48%), and less time was spent in anti-phase coordination in discrete than continuous drumming (Mdiscrete = 1.80%, Mcontinuous = 3.25%). These main effects were mediated by a group by task by instruction type interaction, F(4,54) = 2.77, p< .04. As can be seen in Figure 3, post hoc analysis of comparisons between the tasks revealed that adults with Down syndrome spent less time in anti-phase drumming with the visual metronome in discrete drumming than continuous drumming and mental age-matched adults spent less time in anti-phase with auditory instructions in discrete drumming than continuous drumming. Within continuous drumming, there were no differences in instructions within each group, however chronological age-matched adults spent less time in anti-phase using the auditory instructions than the mental age-matched. Within discrete drumming, there were no differences among instructions within each group, however, chronological age-matched adults spent less time in anti-phase using verbal instructions than persons with Down syndrome. This is consistent with the previous research indicating a verbal-motor deficit in coordination in persons with Down syndrome for discrete movements (Elliott & Weeks, 1993). Figure 3 | Percent of time during a trial in anti-phase coordination as a function of group, task and instruction type. For the measure of percent time intermediate phase, there were significant main effects for group, F(2,27) = 6.34, p< .006 and task, F(1,27) = 5.89, p< .03. Post hoc analysis revealed that, overall, the mental age-matched group spent more time in this less stable coordination pattern than the chronological age-matched (MMA = 11.27%, MCA = 6.72%, MDS= 9.88%), and more time was spent in intermediate phase in continuous than discrete drumming (Mcontinuous = 10.39%, Mdiscrete = 8.19%). This is the first study to examine bimanual continuous and discrete coordination in adults with Down syndrome within one study. In addition, this study advanced on previous studies by testing an externally valid task (i.e., drumming) in response to different types of instructions. Overall, mental age-matched adults and adults with Down syndrome performed similarly in drumming movements by producing larger, more curvilinear movements and less coordinated movements than chronological age-matched adults. This similarity between mental age-matched adults and adults with Down syndrome supports previous research in adults with Down syndrome (Ringenbach et al., 2003; Ringenbach & Lantero, 2005) and points towards syndrome cognitive limitations in performing drumming movements to different instructions. In addition, there were some interesting task and instruction differences that are discussed below. Overall, discrete drumming movements were performed with a more linear path and shorter movements than continuous drumming, which were performed with a more curvilinear path and with larger amplitudes. We believe that for continuous drumming participants moved a greater distance away from the drum and brought their drumsticks up and towards their shoulders to help keep the rhythm by filling the time between beats. This is likely because it is known that persons with Down syndrome have difficulty timing movements (Chiarenza, 1993; Ringenbach et al., 2003). Thus, perhaps the adults with Down syndrome and mental age-matched adults utilised this strategy to overcome their timing difficulties. For discrete drumming this was not necessary because it was a one-time action. For individual hand spatial-temporal measures, there were no performance advantages between instruction types for discrete drumming, whereas there was a performance advantage for visual instructions when performing continuous drumming for all groups. Specifically, when performing continuous drumming movements, the visual instruction resulted in shorter, more vertical movements than auditory and verbal instructions. These findings are not consistent with findings from previous studies and our hypothesis of an auditory instruction advantage for continuous movements (Ringenbach, Chua, Maraj, Kao & Weeks, 2002; Ringenbach et al., 2003; Robertson et al., 2002). However previous research used non-specific visual instructions (e.g., blinking light), which provided only timing information about the specific tasks (e.g., circle drawing or line drawing) but no spatial information. The present study utilised visual instructions that provided timing and spatial information related to the desired movement (i.e., actual video tape of the drumming movements). Thus, we believe that the shorter, straighter movements with the visual instructions were a consequence of the participants matching their drumming movements to the video image on the screen, which showed small vertical movements. This is consistent with observational learning research that suggests that modelling is an efficient strategy for learning (McCullagh, Weiss & Ross, 1989), even in persons with Down syndrome (Biederman, Stepaniuk, Davey, Raven & Ahn, 1999). Our results also are consistent with the modality appropriateness hypothesis (Welch, Duttonhurt & Warren, 1986) that states that visual information is best for spatial aspects of tasks. In addition, in some situations for persons with Down syndrome, auditory instructions resulted in larger movements than visual instructions, and straighter movements than verbal instructions. These auditory-motor differences may be explained by the desire of the participants with Down syndrome to match the sound level of the auditory instructions. As with the visual instruction, these auditory instructions were more task-specific. Instead of hearing a repetitive tone, as with previous studies, participants heard an actual drum beat. Often times, participants were observed hitting the drums softly with other instruction types, but increased force to match the loud drumbeat provided by the auditory instruction. Therefore, we believe that the vertical distance of the drumming movements made by the participants with Down syndrome increased as a result of them increasing force in order to match the drumming sound of the auditory instruction. This is consistent with the force-distance relationship suggesting that force and distance are positively related (Fourier & France, 1997). In other measures, verbal and auditory instructions resulted in similar drumming movements. An explanation for this may be that participants processed the verbal instructions as an auditory beat, rather than actually interpreting the words. This would eliminate the processing delay that is characteristic of atypical cerebral specialisation for verbal-motor processing in adults with Down syndrome. Future research should randomise the order of verbal instructions (e.g., right, left, right, right, left, etc.) in order to evaluate verbal-motor processing. For coordination measures, there were no differences between instruction types among groups for both continuous and discrete drumming. We believe that the specific nature of the instructions and the ease of symmetrical drumming were responsible for producing accurate symmetrical drumming. Further research should investigate more complex coordination patterns in drumming. Overall, the results of this study showed that there were no large differences in performance in response to different instructions for discrete tasks, while different instruction types resulted in differences in performance in spatial-temporal measures for continuous drumming. This shows that the model of atypical cerebral specialisation for persons with Down syndrome is somewhat limited in its application because it must take into account the specificity of the instructions and the type of task. 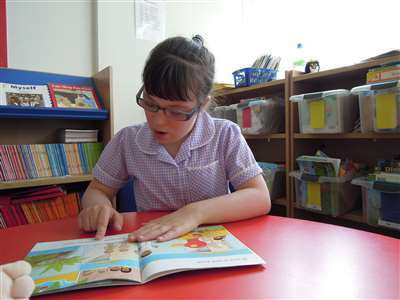 To generalise our results to society, when educators, coaches, therapists, and parents are trying to teach adults with Down syndrome discrete tasks (e.g., picking up a ball), it is not as crucial if they give a visual, auditory, or verbal instruction. However, instruction type is influential when teaching an adult with Down syndrome spatial-temporal aspects of a continuous task (e.g., clapping, juggling). Furthermore, focus should be placed on supplying task specific instructions when performing coordination tasks. Carson, R.G., Thomas, J., Summers, J.J., Walters, M.R. & Semjen, A. (1997). The dynamics of bimanual circle drawing. Quarterly Journal of Experimental Psychology, 50A, 664-683. Chiarenza, G.A. (1993). Movement-related brain macropotentials of persons with Down syndrome during skilled performance. American Journal on Mental Retardation, 97, 449-467. Edenfield, T.N. & Hughes, J.E. (1991). The relationship of a choral music curriculum to the development of singing ability in secondary students with Down syndrome. Music Therapy Perspectives, 9, 52-55. Elliot, D. & Weeks, D.J. (1990). Cerebral specialization and the control of oral and limb movements for individuals with Down's syndrome. Journal of Motor Behavior, 22, 6-18. Elliott, D. & Weeks, D.J. (1993). Cerebral specialisation for speech perception and movement organisation in adults with Down's syndrome. Cortex, 29, 103-113. Elliot, D., Weeks, D.J. & Elliott, C.L. (1987). Cerebral specialisation in individuals with Down syndrome. American Journal on Mental Retardation, 92, 263-271. Franz, E.A., Zelaznik, H.N. & McCabe, G. (1991). Spatial topological constraints in a bimanual task. Acta Psychologica, 77, 137-151. Fourier, U.T. & France, G. (1997). Movement control in golf putting. Human Movement Science, 16(5), 597-619. Hartley, X.Y. (1982). Receptive language processing of Down's syndrome children. Journal of Mental Deficiency Research, 26, 263-269. McCullagh, P., Weiss, M.R. & Ross, D. (1989). Modelling considerations in motor skill acquisition and performance: An integrated approach. Exercise and Sport Sciences Reviews, 17, 475-513. Oldfield, R.C. (1971). The assessment and analyses of handedness: The Edinburgh inventory. Neuropsychologia, 9, 97-113. Pipe, M.D. (1988). Atypical laterality and retardation. Psychological Bulletin, 104, 343-349. Ringenbach (Robertson), S.D., Chua, J.B., Maraj, B.K.V., Kao, J.C. & Weeks, D.J. (2002). Bimanual coordination dynamics in adults with Down syndrome. Motor Control, 6, 390-409. Ringenbach (Robertson), S. D. & Lantero, D. A. (2005). Adults with Down syndrome coordinate best under preferred conditions. Adapted Physical Activity Quarterly, 22, 83-98. Robertson, S. D. (2001). The development of bimanual skill: The search for stable patterns of coordination. Journal of Motor Behavior, 33(2), 114-126. Robertson, S.D., Van Gemmert, A.W.A. & Maraj, B.K.V. (2002). 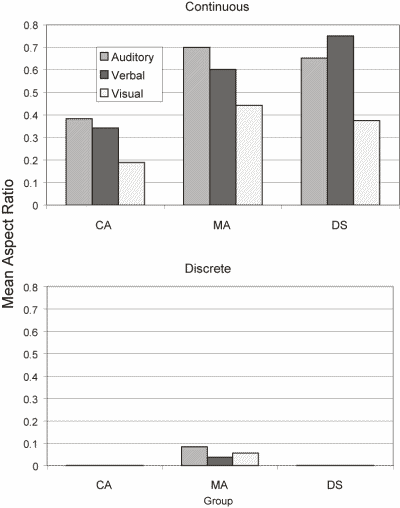 Auditory Information is beneficial for adults with Down syndrome in a continuous bimanual task. Acta Psychologica, 110, 213-229. Scholz, J.P. & Kelso, J.A.S. (1990). Intentional switching between patterns of bimanual coordination depends syndrome on the intrinsic dynamics of the patterns. Journal of Motor Behavior, 22, 98-124. Velasquez, V. (1991). Beginning experiences in piano performance for a girl with Down syndrome: A case study. Music Therapy Perspectives, 9, 82-86. Wang, P.P., Doherty, S., Hesselink, J.R. & Bellugi, U. (1992). Callosal morphology concurs with neurobehavioral and neuropsychological findings in two neurodevelopmental disorders. Archives of Neurology, 49, 407-411. Welch, R.B., Duttonhurt, L.D. & Warren, D.H. (1986). 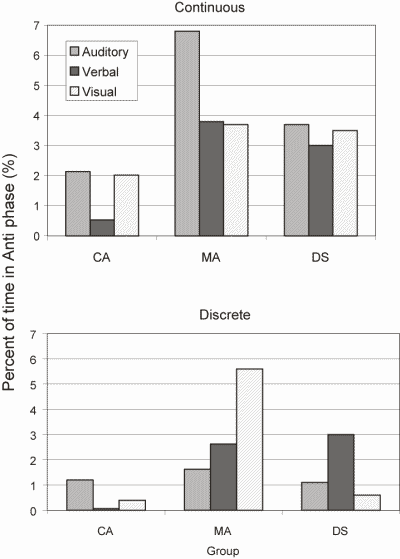 Contributions of audition and vision to temporal rate perception. Perception and Psychophysics, 39, 294-300. Weeks, D.J., Chua, R. & Elliott, D. (2000). Perceptual-motor Behavior in Down Syndrome. Champaign, IL: Human Kinetics.